Here at Mountainfeet in Marsden the owner, Si Taylor, takes a pride in customer service and in particular footwear fitting. 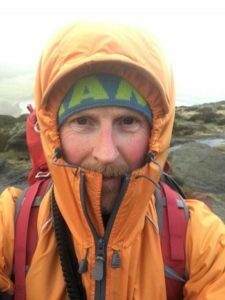 It’s becoming increasingly hard to get the right kind of attention needed when purchasing walking, climbing and running footwear and he has aimed to help reverse that trend and give a service that he know the superstores can’t offer. Si has years of footwear fitting experience and just as importantly, has studied foot health and biomechanics so that he has an expert understanding of the complex issues that allows him to provide individual customers with the correct footwear solution for their varied foot types and lifestyles. People are still being sold footwear by shops who operate much as they have done for the last twenty or thirty years and haven’t evolved in expertise or knowledge. Surely, a customer buying technical footwear deserves to be served someone who knows as much about lower limb anatomy and biomechanics as they do about footwear? Si feels that way for sure and offers expertise based on experience, medical study and knowledge of the sports Mountainfeet sell footwear for. Unsupportive and ill fitting footwear can easily cause extra fatigue or injury and often result in inflammation or blisters that ruin a good days sport. Luckily, most folk don’t begrudge spending both time and money on their feet and the results can be almost life changing, particularly for those who have been inadvertently wearing badly fitting, unsupportive shoes and boots for years. A significant number of people have feet which suffer some form of musculoskeletal problem, resulting in major or minor issues when walking and running. Additionally, the natural ageing process contributes to ongoing alteration of foot function and structure. That’s why it’s vital to buy boots and shoes from shops whose staff understand the biomechanical workings of the foot and can fit and customise boots competently. 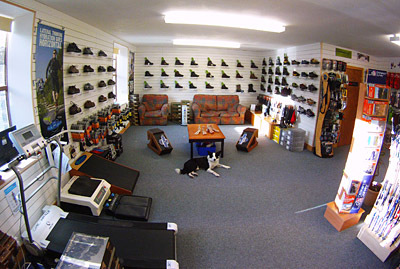 The first part of Mountainfeet’s footwear fitting process involves a chat and a simple functional assessment which can spot potential or existing problems a customer might have. To keep professional levels high, Si devotes time to interacting with podiatrists and updating his knowledge so he can make expert judgments as to a customers needs based on the many variables involved. 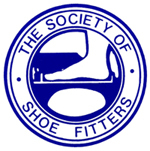 Si is also a qualified member of the Society of Shoe Fitters (MSSF). If you visit Mountainfeet then please remember that what you think is your normal shoe size is only a rough starting point. The ‘last’ (foot shape) used by different manufacturers to build their boots varies greatly and you could well be a size 10 in one boot and a size 11 in another. Your foot will be measured on a ‘Brannock Device‘ which is also a valuable diagnostic tool which helps gauge the shape and volume of your foot. You’ll generally be measured both sitting and standing so an assessment can be made of the way your feet and lower limbs function under loading. At the end of the day it’s the fit that matters, not the numerical size. It’s highly important to let Si know what the footwear will be used for and where you’ll be taking it. 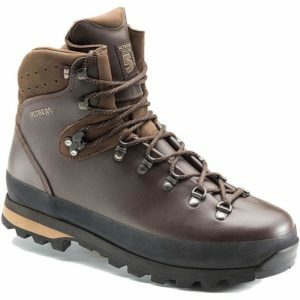 The majority of walking boots and many of the walking or approach shoes have waterproof membranes which are ideal for most UK conditions but don’t suit every use. You may be better with something more breathable where the onus rests on you as to how waterproof it can be made by the use of protective and conditioning products. It’s recommended that once you’ve found a boot that has a good fit and seems to suit you, leave it on one foot and try further models on the other foot. You’ll immediately know whether another product is going to be more suitable. Despite the fact that there are many different models of footwear in the shop, don’t be surprised if you are guided fairly quickly to just two or three that are uniquely suited to your feet. Remember, a boot that’s a tiny bit too big is often capable of being modified to fit but a boot that’s too small will usually ALWAYS be too small. If you’re unsure between two sizes you should usually go for the bigger one – it can always be snugged up in the future with special volume adjusters. According to leading podiatrists, 90% of patients wear shoes that are too small and many customers are surprised when they’re told that they need a bigger shoe or boot than they’ve previously been used to. Having said that, Mountainfeet has equipment that can stretch existing shoes and boots to accommodate particular areas of difficulties such as bunions. 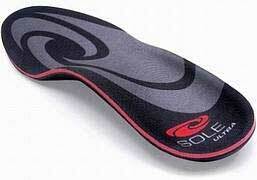 If you’ve got pain under your feet then you might assume you need lots of soft cushioning and buy a cheap foam insole. It’s not necessarily the case and often the best remedy is to stabilise the foot using an orthotic insole which actually feel fairly hard to the touch. 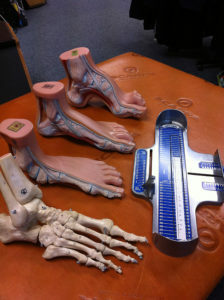 Si is an experienced orthotic fitter and will be happy to explain the science to you if you’re interested. For more details see the Orthotics page. Remember also that an incorrectly aligned skeleton is often a result of an incorrect stance caused by a lack of support at foot level. So if you have knee, back, hip or even neck aches and pains, they could quite possibly be caused or at least exacerbated by incorrectly fitted or unsupportive footwear. If after conversing with you and examining your feet Si finds a problem needing more expert appraisal, he may refer you on to our highly regarded Podiatry Clinic next door to the shop. It’s recommended that most people who spend a lot of time on their feet consider some sort of properly fitted supportive insole in their footwear – don’t wait till you’ve GOT problems, work at PREVENTING them in the first place! The correct insole can not only prevent certain problems and injury but can reduce fatigue which will help you perform better when walking or running. Lacing footwear properly can transform the fit of a boot and most people with comfort problems often don’t lace boots up correctly. Various ‘zones’ of a boot can be laced up with different tension using a couple of tricks Si will be happy to show you. You will generally get a good fit ‘out of the box’ but if you have problems like heel spurs or bunions then the boot may need modifying. There is much that can be done to improve the fit of a standard boot and Si always looks carefully at a customers foot before starting to consider individual boot models. One of the things Si sees on an almost daily basis are customers who are wearing footwear that is too small for them. Because of changes in an individuals age, weight and fitness, the foot can change shape as it gets less able to support the body properly. This needs recognising and if necessary, extra room should be made available in footwear – it’s often advisable for customers to go up a complete UK shoe size to allow their feet to function properly. Bear in mind that you may have particularly wide or narrow feet that will suit a certain manufacturers boot but preclude you from wearing another. Come in to the shop with a fairly open mind and let Si suggest some models that should suit you. There’s such a lot of very good footwear from a diverse range of manufacturers and you shouldn’t get hung up over just one! The sock worn with a good quality boot is an essential part of the package. In the good old days, socks were used as ‘padding’ to improve the fit of a boot that probably wasn’t very anatomically designed. Consequently the old ‘two pairs of thick socks’ advice should really be disregarded as should many of the old wives tales regarding footwear fitting. Mountainfeet stocks a great range of high spec, specifically designed walking socks in a range of thicknesses. Wool is blended with high tech yarns designed to work in conjunction with modern boots to keep feet warm in winter but cool and dry in Summer. You may wish to wear a thin liner sock under the walking sock to alleviate blister problem and to help keep your foot dry and fresh. In winter, a thermal liner sock will give an extra layer of insulation. Si Taylor, Mountainfeet’s owner, has trekked, biked and travelled abroad in many climates so if you’re buying for your first big trip then he’ll be happy to give you the benefit of any experience he has. Conversely, he loves talking to those who have travelled widely and is always keen to learn more himself! Si is an active mountain enthusiast who uses much of our range of footwear and understands it. From walking the dog to high altitude mountaineering – he will endeavour to help. Si also has experience in running – both on and off road. Mountainfeet supplies running shoes from Salomon, La Sportiva, Scott, Inov-8 and and Asics and are always looking to put more range into the shop. Si isn’t saying that he can help every single person achieve the perfect fit but he is able to serve most people’s needs and has hundreds of satisfied repeat customers who have put their trust in him. 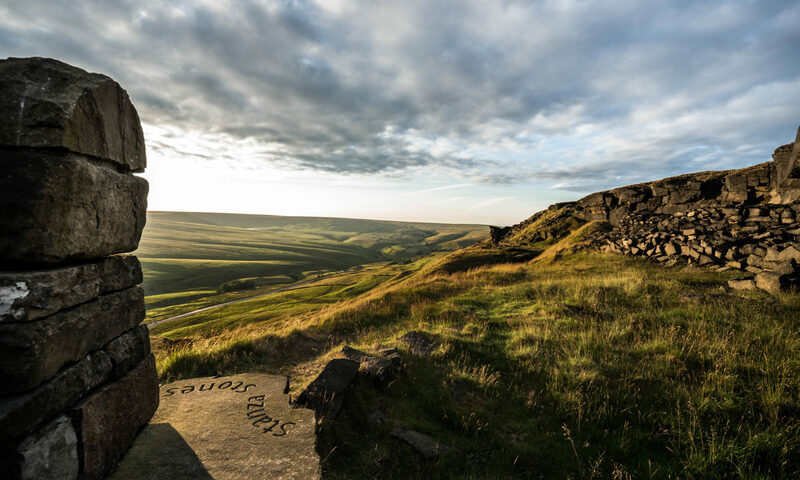 Come and talk to Si at his friendly shop in Marsden – he’s at your service..